The Mothers of Arles is a French festival that runs from May 24 through May 28. This unique festival celebrating the triple goddess is still alive and well in France, celebrated mostly by gypsies. The “Three Maries of the Sea” recall the ancient goddess of life, death, and beauty. 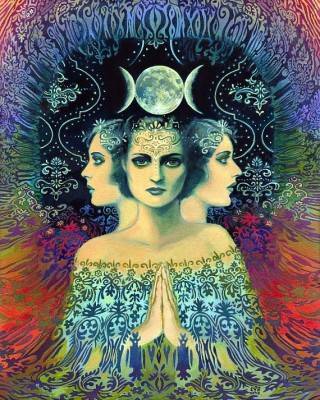 The gypsies gather from all over Europe and carry on their annual celebrations of the triple goddess. Three women dressed up as Mare, Tavobe, and Mary impersonate the goddesses, reaching the shore in boats. In modern times, Sarah and Salome are the companions of Mary in this trinity. Fancy processions, gypsy weddings, trading of all sorts, fortune-telling, the leaping of cows (a survival from the ancient practice of bull leaping), dancing gypsy style, and candles give these days and nights their wild beauty. St Sara of Egypt is the Romanies’ patron saint. Throughout the eve of May 24 and during May 25th, Gypsies exalt the elements of fire and water. From wood the men have gathered, Gypsy women build a healthy campfire. They cook a huge feast and gather around the fire to exchange presents and good cheer. On May 24th many Romanies still make a pilgrimage to attend an annual service at the shrine of St Sara of Egypt, in the crypt of the church of Les Saintes Maries de la Mer in the Ile de la Camargue, Bouches-du-Rhone, France. 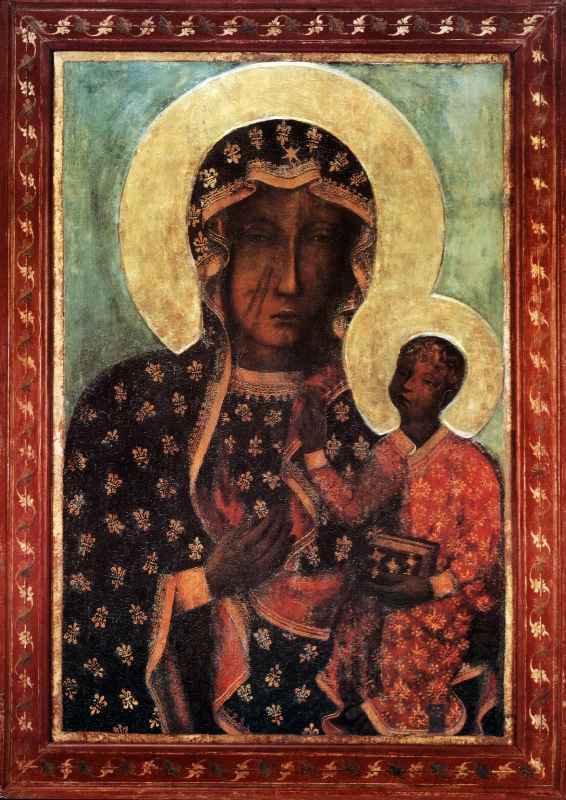 They carry the statue of St. Sara, who is black, into the sea (from where she originated) and out again. 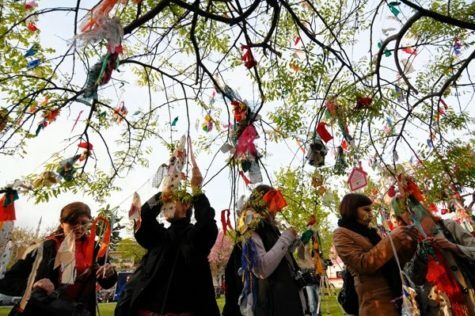 Hidrellez (celebrated on May 6th) is a very significant day, not only for gypsies. It’s been very significant in Anatolia for centuries. The word itself is the combination of names of two prophets: Hizir and Ilyas. Hidrellez signifies a rebirth of nature and is also considered to be the beginning of summer. It is said that whatever you wish for that night comes true! According to Anatolian people’s beliefs, Hizir and Ilyas are two prophets who drank from the fountain of youth; they are brothers and friends. They have given each other promise to meet on this night of May 5 every year to give rebirth to nature. Hizir is the protector of plants; he gives life to plants. He helps poor people. Wherever he goes, he brings abundance. Ilyas is the protector of waters and according to some, the protector of animals. Wherever he goes, animals become healthier. People believe that wishes made on this night will come true. They also believe that sick people will become healthier and it will be the end of bad luck and misfortunes. There are also a lot of rituals that people perform. Some people put a coin inside a red cloth and then hang it on a rose branch. In the morning this money is put into the wallet so that it will bring abundance. It is also believed that if you go out, have a picnic and be in nature on this day, your days in winter will have less hardship. Most city people know this day simply as a picnic day. 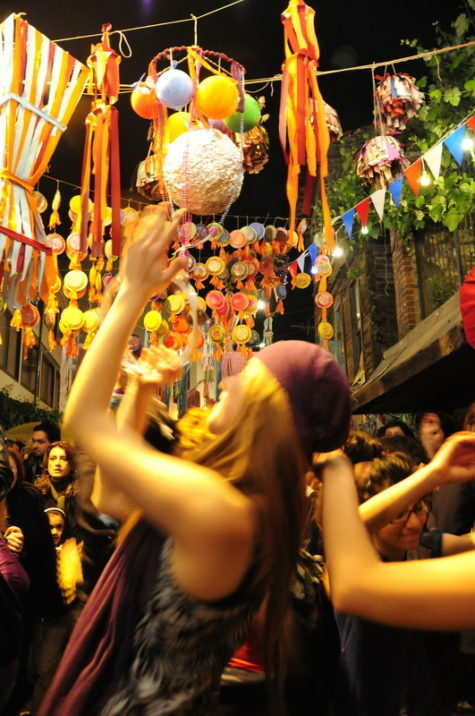 Although it is commonly celebrated everywhere in Turkey, its mood is more festive among the Roma community. Apart from Edirne, Istanbul also hosts a major celebration by the Romanis in the historic Ahırkapı district, which was marked with a parade of community members in extravagant and colorful costumes. Đurđevdan is a major holiday for Roma from former Yugoslavia, whether Orthodox or Muslim. The various Balkan spellings (Herdeljez, Erdelezi) are variants of the Turkish Hıdırellez. Ederlezi is the Gypsy name for the Bulgarian and Serbian Feast of Saint George. It’s celebrated on the 6th May, a holiday signaling the beginning of spring, occurring approximately 40 days after the spring equinox. This Spring festival is especially celebrated by Roma people around the former Yugoslavia (and elsewhere around the world), regardless of religious affiliation. This holiday celebrates the return of springtime and is considered most important. The traditions of the Roma Durđevdan are based on decorating the home with flowers and blooming twigs as a welcoming to spring. It also includes taking baths added with flowers and washing hands with water from church wells. Also the walls of the home could be washed with the water. On the day of the feast it is most common to grill a lamb for the feast dinner. The appearance of music is also very important during this holiday. Aside from dancing and singing, traditional Brass bands are popular. Đurđevdan in Serbian, Gergyovden in Bulgarian or Jurjevo in Croatian and Bosnian, “George’s day”, is a South-Slavic religious holiday, celebrated on April 23 by the Julian calendar (May 6 by Gregorian calendar). The feast of Saint George is attached to the tradition of celebrating the beginning of spring, and is a very important Orthodox Christian custom of honoring a family patron saint. Saint George is one of the most important Christian saints in Orthodox churches. Christian tradition holds that St. George was a martyr who died for his faith. On icons, he is usually depicted as a man riding a horse and killing a dragon. Jurjevo is mainly celebrated in the rural areas of Croatia, mostly Turopolje and Gornja Stubica whereas every Đurđevdan is celebrated in many Serbian communities, but mainly in Serbia, Montenegro and Bosnia Herzegovina. In Croatian St. George is called Sv. Juraj while in Serbian he’s called Sveti Đorđe and in Bulgarian- Sveti Georgi. In Croatia, the Catholic version of St.George’s day, Jurjevo is celebrated on April 23 by the Gregorian calendar. The tradition is mostly celebrated in northern Croatia, in Zagreb County. According to tradition this day marks the beginning of spring. The use of bonfires is similar to Walpurgis Night. In Turopolje, Jurjevo involves a slavic tradition where five most beautiful girls are picked to play as Dodola goddesses dressed in leaves and sing for the village every day till the end of the holiday. 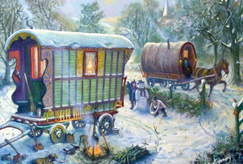 In the old days (back in the 1800’s), this is how the Hungarian Gypsies celebrated Easter Monday. They made a wooden box or receptacle called the bìcáben, pronounced like the English gypsy word bitchapen and meaning the same, that is ~ a sending, a thing sent or gift. 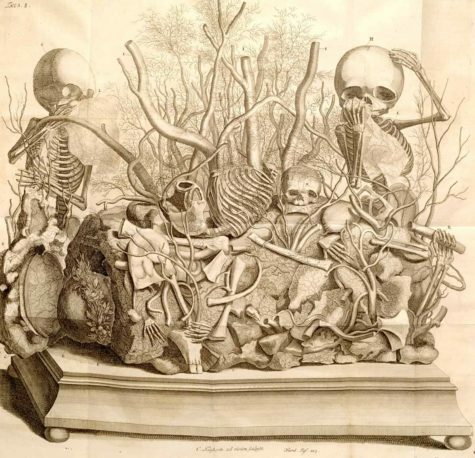 In this, at the bottom, two sticks were placed across, “as in a cradle,” and on these were laid herbs and other fetish, or meaningful stuffs which every one touched with the finger; then the whole was enveloped in a winding of white and red wool. The box was then carried by the oldest person of the tribe (or family) from tent to tent; after every one had spat upon it, it was borne to the next running stream and left there. By doing this, all the diseases and disorders which would have befallen them during the coming year were conjured into the box. But woe to him who might find the box and open it, instead of throwing it at once back into the stream! All the diseases exorcised by the gypsy band will fall upon him and his in full measure. Note: This post was compiled by Shirley Twofeathers for Gypsy Magic and Lore, you may repost and share it only if you give me credit and a link back to this website. Blessed be.